The existence of the two extra ‘moons’ was hotly debated for over 50 years but as per a recent National Geographic report, Hungarian astronomers and physicists have finally provided enough data to confirm. The moon has at least two other companions made entirely of dust. The team of researchers confirmed their presence through photographs of the natural bodies at a distance of approximately 250,000 miles more or less the same distance as our moon. The Kordylewski clouds are always changing. They might be stable in orbit and may have existed for millions of years, but the ingredients that make the clouds the dust particles are always getting swapped for others. Speculations about Earth having multiple moons have taken turns in astronomer circles for years. It was realized that if extra moons did exist, they could only do so in stable points in Earth’s orbit. Lagrange points are sweet spots in a planetary orbit where the pull of gravity working from two opposing celestial bodies is balanced due to the centripetal force of their orbits. Thus, an object at a Lagrange point will remain fixed at a constant distance from both the moon and Earth. In the 1950s, Kordylewski searched two Lagrange points L4 and L5 where he found the first glimpse of the two dust clouds orbiting Earth. These huge clouds of dust could add much to space exploration efforts when it comes to fuel consumption and safety issues. Sometimes, satellites need to be parked at the Lagrange points so that the spacecraft consumes minimal fuel and can still stay in orbit. The James Webb Space Telescope will be set up at the L2 Lagrange point in 2020 for this purpose. Moreover, space agencies are also planning to use Lagrange points as transfer stations for Mars missions. The Western Pacific nation of Palau has become the first country to ban many kinds of sunscreen, in a move to protect its coral reefs from chemicals that scientists say cause significant damage. Under the ban “reef-toxic” sunscreen is defined as containing one of 10 prohibited chemicals, a list that could grow later can be confiscated from tourists when they enter the country. Retailers who sell it can be fined up to $1,000. How these chemicals trigger Coral Bleaching? Damage to coral reefs worldwide from climate change has been widely reported. But scientists say there is growing evidence that chemicals from sunscreen, which washes off swimmers or enters the ocean through sewer systems causes grave harm. Even a low concentration of sunscreen in the water can hinder the development of young coral. It causes localized coral bleaching and can disrupt the reproduction of fish by interfering with their hormonal systems. A 2015 study found that oxybenzone in sunscreen stunts coral growth and is toxic for the algae that live within reefs. Recently the Supreme Court has directed the Contesting Candidates to publicize information about the criminal cases against a candidate. The costs incurred on this publication will be counted as part of poll expenditure, according to the Election Commission. The expenses will be borne by the candidate and the political parties. This being an expenditure made in connection with the election, if expense is incurred in this regard, the same will be counted for the purposes of election. There is no limit on the party election expenditure. For Assembly polls, the cap on expenses by the candidates is between ₹20 lakh to ₹28 lakh. The EC said that the FIR cases essentially have to be given publicity. If after filing the nomination, the status of the criminal case changes, it will be open to the candidate to notify the revised status to the Returning Officer and publish the revised status. Separate formats have been specified by the Commission for the candidates and the political parties. Prelims level: RCEP, TPP etc. Several Asian member countries of the proposed RCEP have offered India a significant concession on the extent to which it needs to open up its markets. India can open up 83% of its market against the earlier 92%. The RCEP is a proposed trade agreement between the 10 Association of Southeast Asian Nations (ASEAN) countries and their six free trade agreement partners, namely Australia, China, India, Japan, Korea, and New Zealand. The grouping would comprise 25% of global GDP, 30% of global trade, 26% of FDI flows, and 45% of the population. India is concerned about further opening its market to China and skewing the trade deficit between them further. However the RCEP allows for bilateral agreements also to be made so India can perhaps open up to China gradually and not in one go. India has achieved some success regarding some of its other concerns, such as getting the other RCEP countries to liberalize their services markets and allow for a more free movement of service sector professionals. India stands to gain a lot from joining RCEP at a time when so much trade is being diverted from China because of the ongoing trade tensions with the U.S.
India along with Indonesia and Australia are also due to go to elections in 2019. It is unlikely that these countries would make a decision before the general elections in 2019, even though the RCEP countries have set a December 2018 internal deadline for the “substantial outcomes”. 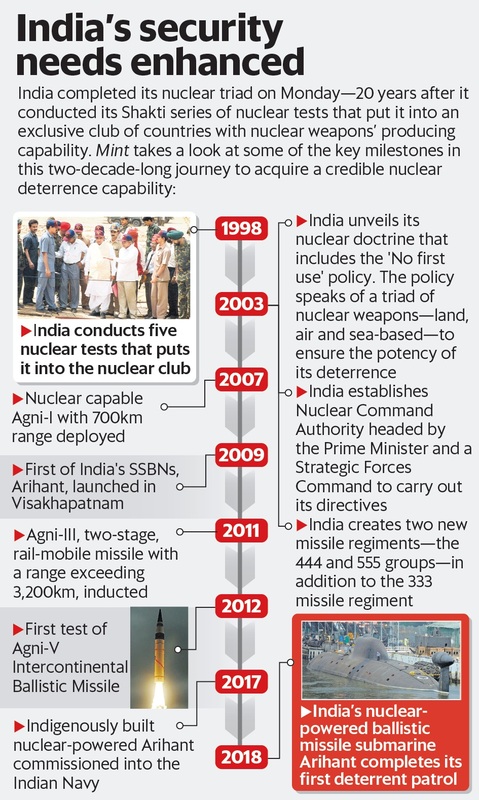 India and a few other countries want only a statement on substantial progress to be made during the summit, and for negotiations to be pushed till next year. This adds to the urgency of concluding the RCEP negotiations as it makes it harder for governments to give any concessions on tariffs and subsidies closer to polls, given political compulsions. 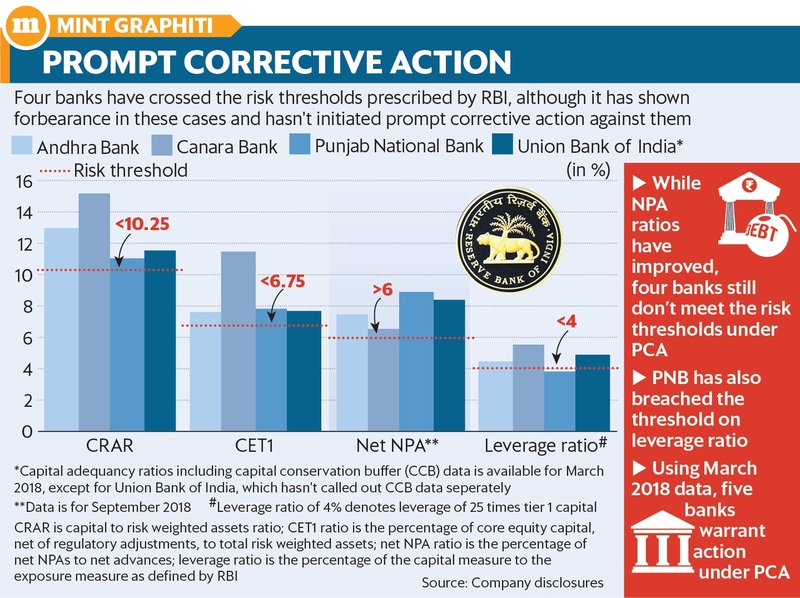 Reserve Bank of India is accused of being too stringent in applying the prompt corrective action (PCA) framework for banks. This has hurt the flow of credit to the economy. PCA has been imposed on 11 state-run banks, which did not meet RBI’s specified thresholds on either capital adequacy, asset quality or profitability. The idea behind this is that banks preserve capital and regain their health, which means that lending takes a hit. Analysis shows that far from being too stringent, the central bank has shown forbearance with some of the banks that are not already under PCA. At least four more banks need to be censured for not meeting the central bank’s specified risk thresholds, if RBI follows a strict rule-based approach. These are Andhra Bank, Canara Bank, Punjab National Bank (PNB) and Union Bank of India. Each of these has breached the maximum permissible levels of 6% for net non-performing advances as a percentage of total advances. RBI rules state that PCA can be imposed if any one of the risk thresholds for capital, asset quality, profitability or leverage is breached. However these banks met the minimum capital requirements needed to avoid PCA. While recognition of NPAs has improved in the Indian banking system, provisioning norms are still conservative. In jurisdictions where only capital ratios are considered in the PCA framework, NPA provisioning norms are more stringent. Perhaps RBI’s forbearance has to do with an expectation that the government will recapitalize these banks, so that provisioning for their NPAs do not drag their capital down to low levels. National regulators track a bank’s CAR to ensure that it can absorb a reasonable amount of loss and complies with statutory Capital requirements. It is expressed as a percentage of a bank’s risk weighted credit exposures. Mains level: Importance of ITU. India has been elected as a Member of the International Telecommunications Union (ITU) Council for another 4-year term (2019-2022). By securing 165 votes, India ranked third among the 13 countries elected to the Council from the Asia-Australasia region, and eighth among the 48 countries elected to the Council globally. The ITU has 193memberstates who elect representatives to the Council. India has been an active member of the ITU since 1869, earnestly supporting the development and propagation of telecom in the global community of nations. It has been a regular member of the ITU Council since 1952, and has played an important role in upholding principles of equality and consensus-building. India’s strong partnership with the ITU was also demonstrated in the recent ITU decision to set up the ITU South Asia Area Office and Technology Innovation Centre in New Delhi buy Jan 2019. ITU is a United Nations specialised agency for Information and Communication Technologies, with membership of 193 countries and nearly 800 private sector entities and academic institutions. The body freezes international standards on telecom technologies that are to be used globally. ITU, based in Geneva, Switzerland, is a member of the United Nations Development Group and has 12 regional and area offices in the world. The ITU coordinates the shared global use of the radio spectrum, promotes international cooperation in assigning satellite orbits, works to improve telecommunication infrastructure in the developing world. The ITU is active in areas including broadband Internet, latest-generation wireless technologies, aeronautical and maritime navigation, radio astronomy, satellite-based meteorology, convergence in fixed-mobile phone, Internet access, data, voice, TV broadcasting, and next-generation networks. India has been member of ITU since 1869 and has also been a regular member of the ITU Council since 1952. Why the US is assertive about the transformation of the middle east? Why is contract enforcement important? Industrial Sector Updates – Industrial Policy, Ease of Doing Business, etc.